Do you trust these people with conflicts of interest to negotiate for the school district? Mr. David McNamara has, in the past, represented the school district in labor negotiations with the teachers union. This raises many ethical questions, not the least of which is the fact that while negotiating on behalf of the district , he helps make decisions about the salary and benefits of his wife, the school nurse, who is included in the teachers labor contract. Perhaps Mr. McNamara would be more suited in representing the teachers union, rather than the other way around. Not only is his wifes income dependent on the teachers contract , but it is also intresting to note that the income of Mr. McNamara is also affected by the outcome of the teachers contract, as Mr. McNamaras employment agreement is based on the teachers union contract. You can read his 2001-2002-employment agreement by clicking here. It reads in part: Sick days (12) shall accrue forward toward retirement as stipulated in the negotiations between the Board of Education and SVETA.  SVETA is the Spencer Van Etten Teachers Association. As shown above both McNamaras had, and still have, financial ties to the teachers union and David McNamara was, in my opinion therefore, unfit it to represent the school district and the taxpayers in any negotiations with the teachers union. 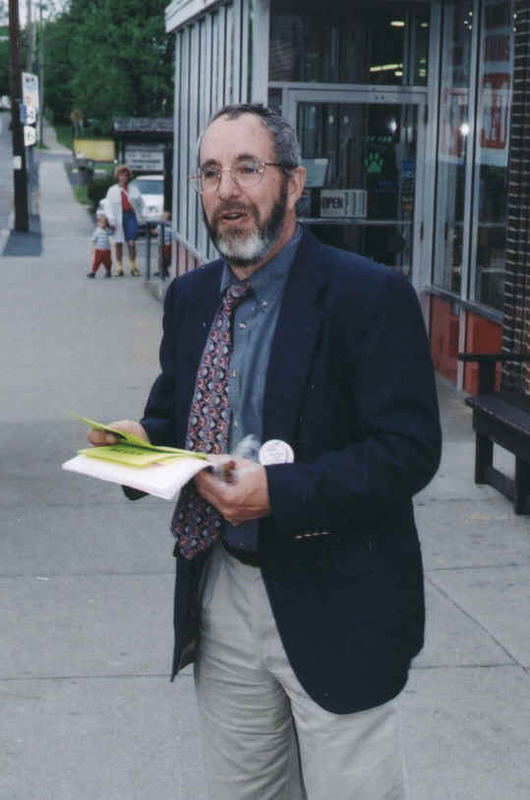 The photo below shows Mr. McNamara campaigning for special interests. I made a motion at the Nov. 26 2002 school board meeting, which would have prevented actual corruption or even perceived improperty. The relevant part of my motion read  Resolved, that persons who represent the school district in labor negotiations may not: personally receive financial gain, nor have a close family member who would gain from negotiations. No much to ask, but even this attempt to reform was voted down by my fellow board members. It seems to me, that the teachers union has an iron grip on Donna Mistler, Denise Price, Martin Stangle, Jim Loomis, Fred Vanderburgh and Helen Riker. Mr. Stangles wife is a member of the teachers union, Helen Riker is a former member and some of her retirement benefits are a line in the teachers contract. The teachers union spent time and money supporting the election of Donna Mistler. Click here to see how once elected, she then represented the school district in labor negotiations against the very people who had campaigned for her.